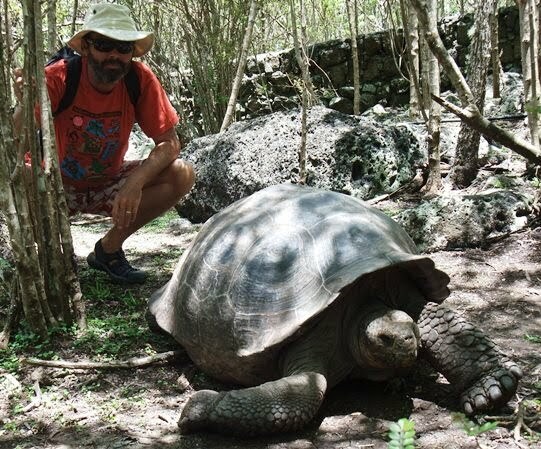 The Galapagos is famous for its wildlife. Here is a sample. Penguins with water approaching 30C. 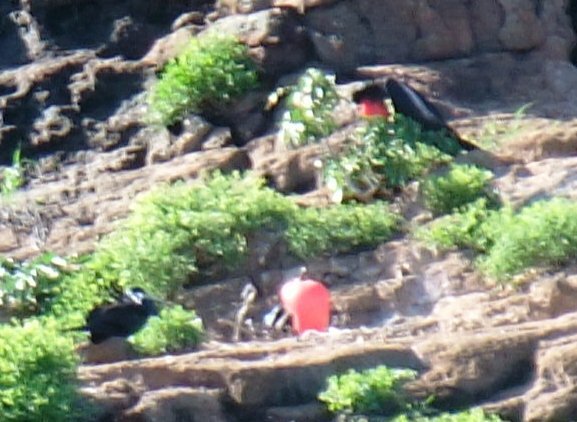 Mating frigate birds. The males stretch their red necks in impressive fashion. A not particularly giant, giant tortoise. Most marina iguanas will let you get that perfect closeup pic. I don’t have much to say about our trip from Bahia to the Galapagos a distance of about 540 miles that took us about 4 ½ days. When we left Bahia with the tide we had SW winds and were hard on the wind, but had our old friend the Humboldt Current to push us northward. Without the current we could lay our destination but for a day or so it looked like we were going to cross the Equator again. Gradually the wind backed southward and we had a pleasant sail for a couple of days before the wind went SE with an apparent speed of about 4 knots. In the end we had to motor for about 15 hours to get to San Cristobal island. 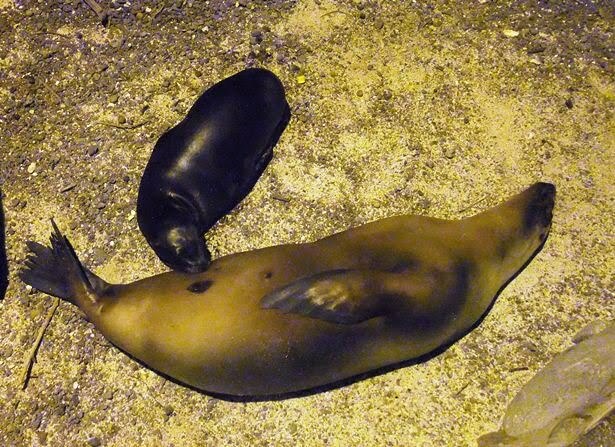 Anchoring a boat in the Galapagos with any steps up from the water is an open invitation for sea lions to move. This is our friend's boat Kailani with a small visitor. At night, the little guys would be evicted by bigger ones and then those by bigger ones still until the biggest, who would not even fit on the step would take over. All of these confrontations were accompanied by much grunting, coughing and other noises. 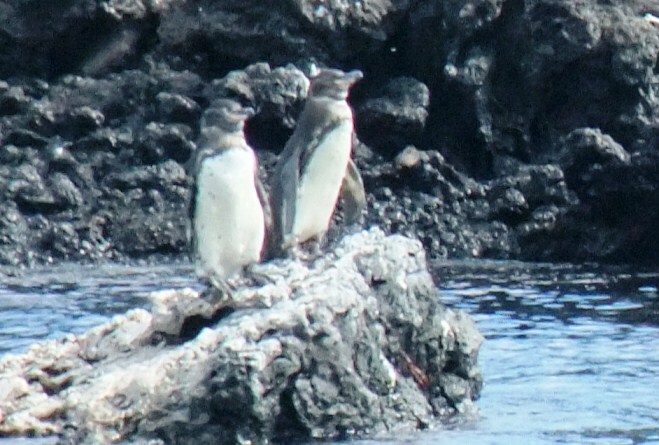 Visiting the Galapagos on a private yacht is not a simple task. The regulations are very strict and are enforced. To make it even more complicated, they are constantly changing. You can choose two types of permits (three actually, but the third would end up costing thousands of dollars). You can get an autografo which allows you to visit four islands and stay for 90 days. This costs about $800. 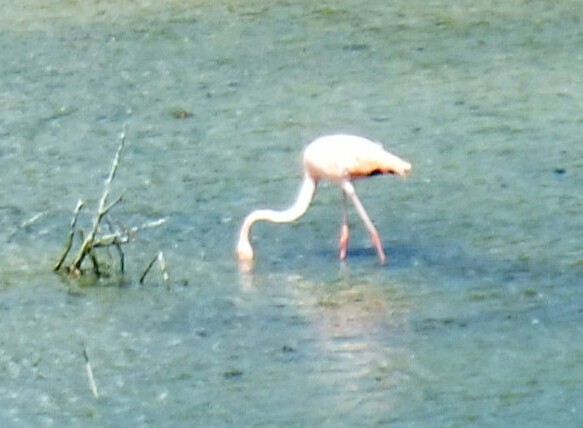 Or, you can get a permit it visit either San Cristobal or Santa Cruz and stay for 20 days. This costs about $270. In both cases, there is a national park fee of $100 per person to be paid. We chose to stay in San Cristobal since it has a better anchorage and to visit other islands on a tour. For touring there are multiple options. Most people go on small cruise ships that visit a variety of islands. The cost for these ranges from $200 to $1000 per person per day. We found a company, Sharksky Tours, that has a tour where you stay in hotels on other islands. The cost was $430 per person for four days including transportation (a 600 hp speedboat that travelled in calm seas at 30 knots), hotels, meals, and tour costs. The hotels were a little better than we had on our land tour since they had air conditioning which was almost a necessity. Sharksky, which is a Seven Seas Cruising Association shore station, caters to cruisers and backpackers and we had four cruisers (ages in the 50s and 60s) and eleven backpackers (ages 20 to 38). The latter, with the exception of one Mexican woman, were all French, Austrian, German, or Swiss. All of these kids displayed remarkable language skills – at one point the Mexican woman was talking to the French woman (who lives and works in Barcelona and is perfectly fluent in Spanish) in English. I asked them why they chose English and they just said that they had been using English on the trip so much it just came naturally. A good lesson for us Gringos. The interactions with these young people added much to the enjoyment of the trip. 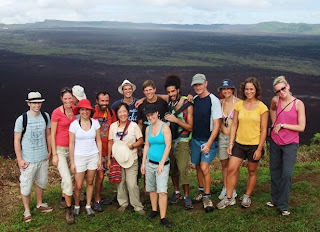 Our great tour group from Austria, Germany, France, Britain, Mexico, Israel, Switzerland, and Canada. American tourists seem to prefer fancier trips. We did quite a bit of snorkelling and saw a few sharks (white-tipped reef sharks, about 5’ long), sea turtles, sea lions, and interesting fish. The highlight of this for me was ducking underwater at one point and being face-to-face (about 5 feet away) with a large (4’ shell) sea turtle. He looked just like the turtle in Finding Nemo! On land, we visited a couple of giant tortoise breeding stations and one place where the tortoises live in the wild. The national park and Darwin Research Station are doing a lot to breed tortoises in captivity and release them into the wild when they are old enough (6 years) that they are safe from predators. They are also trying to eliminate introduced species that either kill tortoise eggs, eat the young tortoises, or compete for food sources. A major one of these are feral goats which have been eliminated on one island but exist in great numbers (50,000) on the largest island, Isabella. At the Darwin center we saw Lonesome George who is the last of the species that existed on one of the smaller islands. They have been unsuccessful in getting George to reproduce with a female from another island so he may be it. Species extinctions are not that rare, but it is different when you see the embodiment of a species in one individual. The adult tortoises are huge with heads that were the model for ET in the movie. They move slowly and for the most part just sit in one place and eat whatever vegetation is at hand. We saw many marine iguanas and a few land iguanas which are much less common. What are not uncommon, especially around the harbour in San Cristobal are sea lions. They are everywhere. At night a couple hundred come up on the beach in the middle of town with some spilling over to sleep on park benches along the attractive waterfront development. 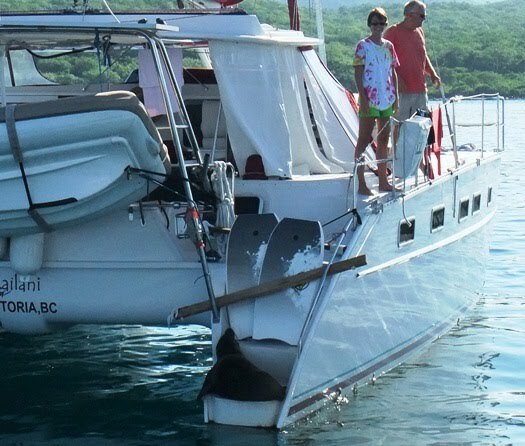 They climb up onto any boat with steps in the transom, in spite of various attempts to block them with fenders, lines, surfboards. When I have been in the water cleaning the bottom of the boat they have been swimming around me. Except for the fact that they are noisy at night (they sound like an old man with a bad cold with coughs, throat clearing, and even sneezes) they are quite delightful beasts to watch. They have little fear of people. When they are napping and you walk by within 6 feet they might open one eye to check you out, but then they just close their eye and doze off again. 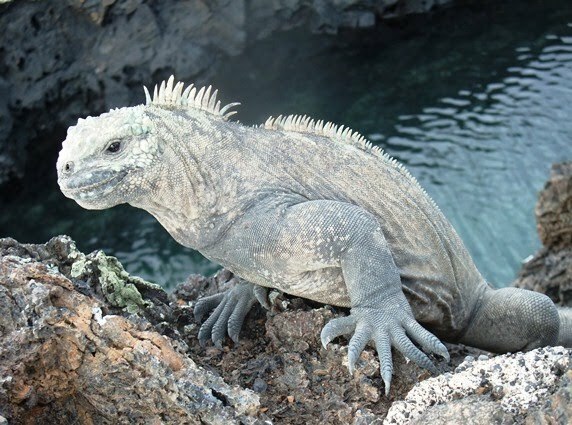 Most of the marine iguanas are similar. We visited one island that had thousands of them and you had to make sure not to step on their tails that might extend onto the path. Now about the Master and Commander thing … the Galapagos islands vary considerably in age from about one million years (and still volcanically active) in the west and northwest to 5 million years and inactive in the east and southeast. M & C and most nature films were made on the newer islands that are quite hard (and costly) for tourists to visit. It is on these islands where you find the unvegetated lava fields. Not surprisingly, on the islands where people live there has been time for soil formation to occur and a vegetative cover to develop. The nature of the vegetation varies enormously depending on the amount of rainfall received (in general rainfall amounts here are small). Along the coast of San Cristobal and other islands it is quite desert-like with many huge cacti. When you go up the volcanoes to 500 m or so the vegetation becomes richer and some trees are seen and considerable farming occurs. Parts of Santa Cruz island could even be considered lush. Even with vegetation introduced species are a problem. Several of the backpackers we travelled with had been part of a volunteer program to eliminate mora or what we would call blackberries. Mora has taken over vast areas of land and crowded out native plants. In addition, tortoises do not eat it. These volunteers have been cutting it down with machetes and then coming back to pull out the young shoots that replace it. The final step is to plant trees that shade the ground and prevent the mora from returning. It sounded like a horrible job in the heat wearing long sleeves and pants, gloves and an insect hood to stop the mosquitoes. If you come, plan to spend a fair bit of time on Isabella. It is huge (5500 sq km) and quiet and even has an exquisite beach. Most of the more interesting spots are in the north and west of the island and hard to get to, but they do allow camping in some places. Posted by Bruce at 5:31 p.m.